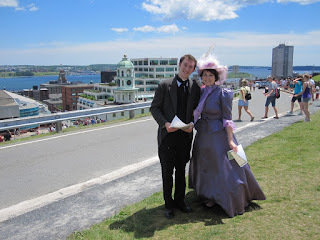 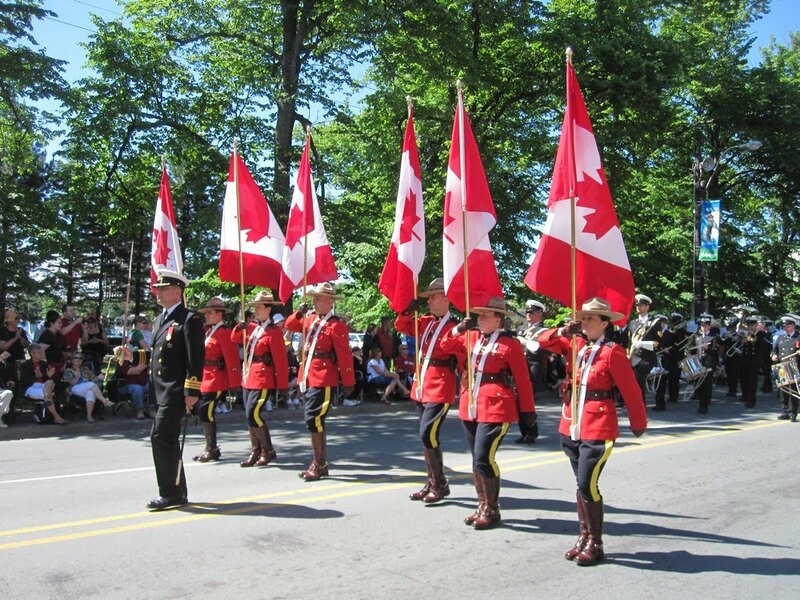 On July 1st, 1867, the British North America Act was signed creating the new nation of Canada. Since that time, Canada has had its ups and downs, but on this, the 143rd Birthday of Canada, the focus was on how much fun one ea-pea could cram into a single day. 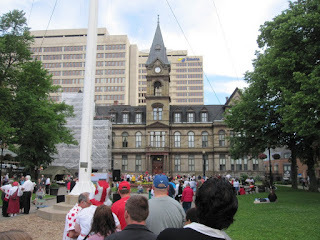 Funapalooza '010 started at 8:00 AM, when I stood in line with over 300 other Haligonians to receive a free pancake breakfast on the Grand Parade in front of City Hall (yes, that building in the background). 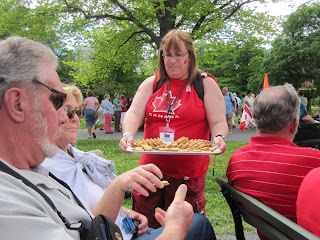 I was so hungry that I went back for seconds and thirds. 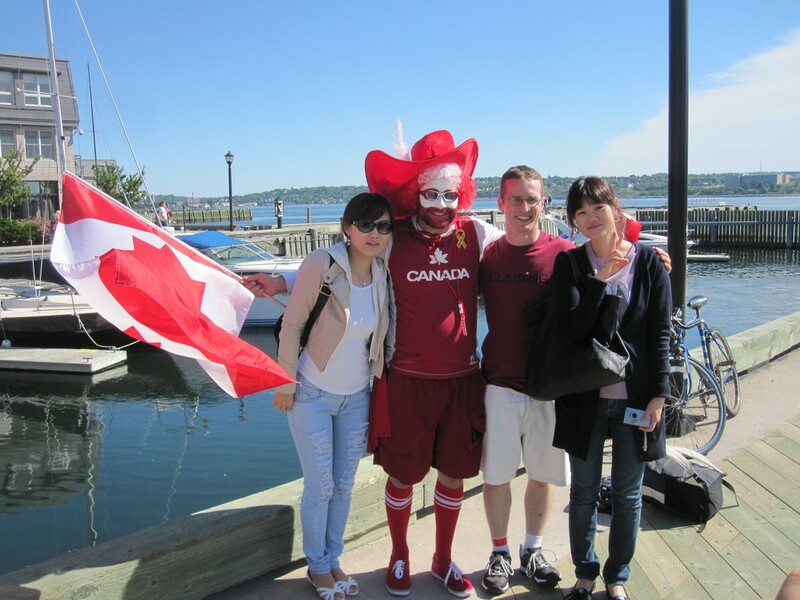 While I was having breakfast, I also ran into my new Korean friend, Jeung Eun-gyo, whom I had met at the Membertou 400 Festival a week ago, and with whom I had gone to visit the ships during International Fleet Review Week. At 9:00 AM, Eun-gyo, some of his classmates who later met us at the Grand Parade, and myself all walked over to Pier 21 where my new friends were having an orientation meeting because they would be volunteering with the Multicultural Festival happening from July 2-4. 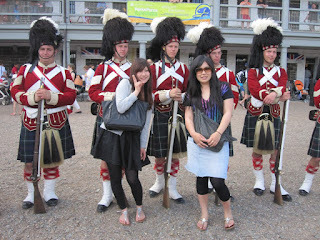 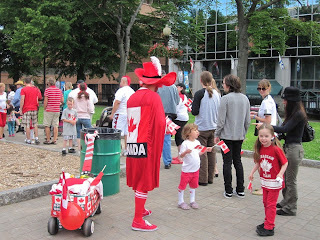 As you can see from the picture above, we ran into Captain Canada again along the board walk too. 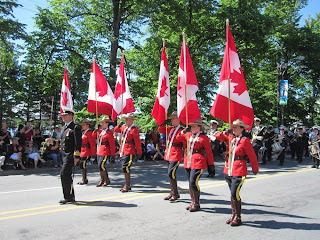 At 10:30 AM, the Royal Nova Scotia International Tattoo's annual Canada Day Parade started, and by 10:45 or so it had made its way down to Spring Garden Road, led by the Mounties (above), where I was waiting curb side. 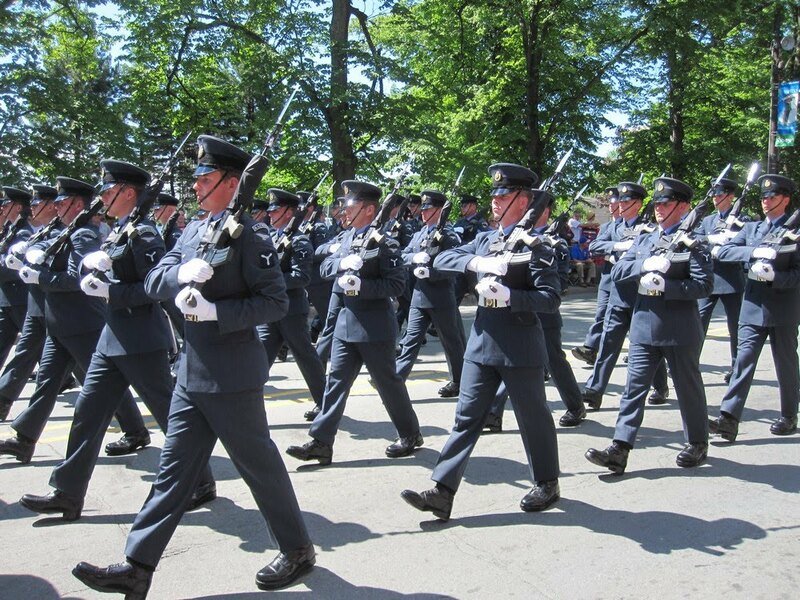 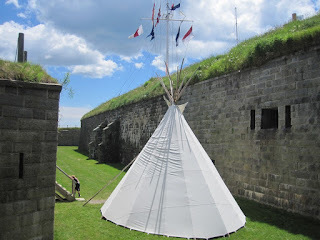 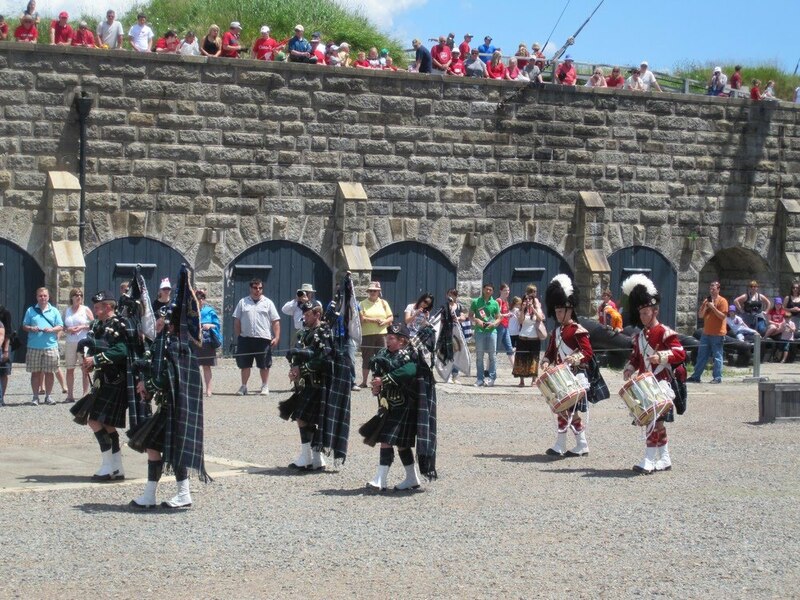 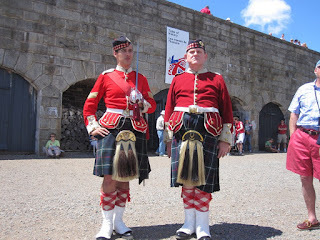 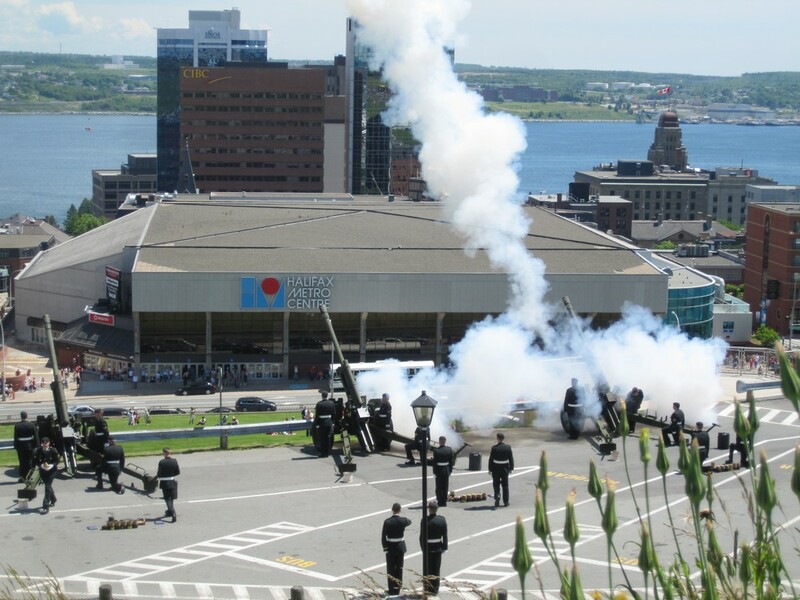 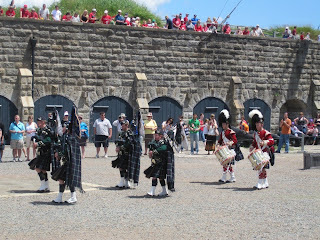 At 11:30 AM it was time to head over to the Citadel, where admission was free for a special Canada Day presentation, including a performance by the Pipes and Drums of the 78th Highlanders, a 21-gun salute, and free birthday cake! 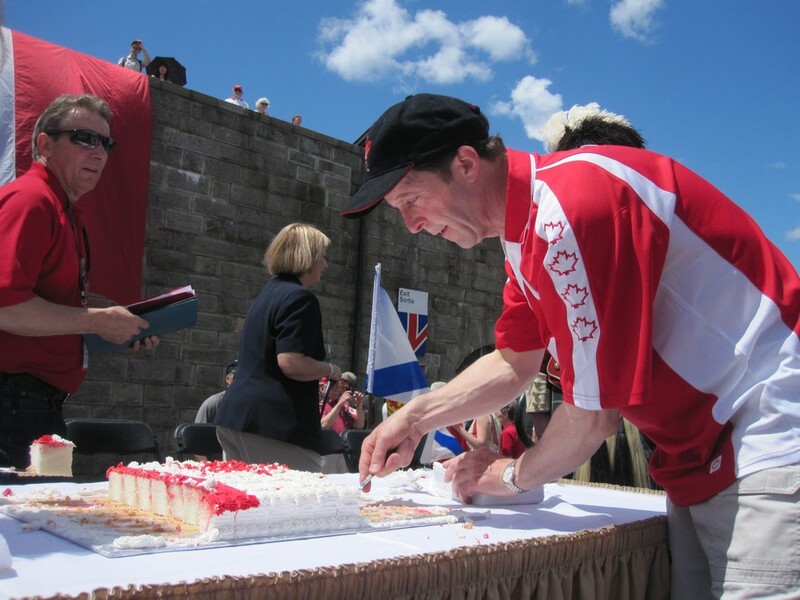 After finishing my cake, I hurried over to the Commons where the annual Canada Day Family Picnic on the Commons was taking place. 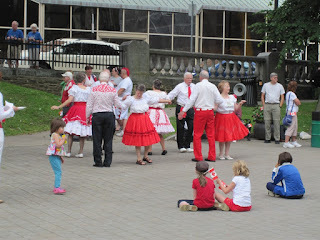 Since I wasn't a child, and I didn't have one, this wasn't very interesting to me, and I figured I shouldn't hang around too long taking pictures of other people's children, so I continued on to the next Funada Day event. 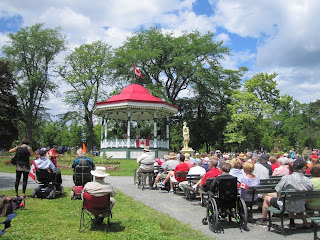 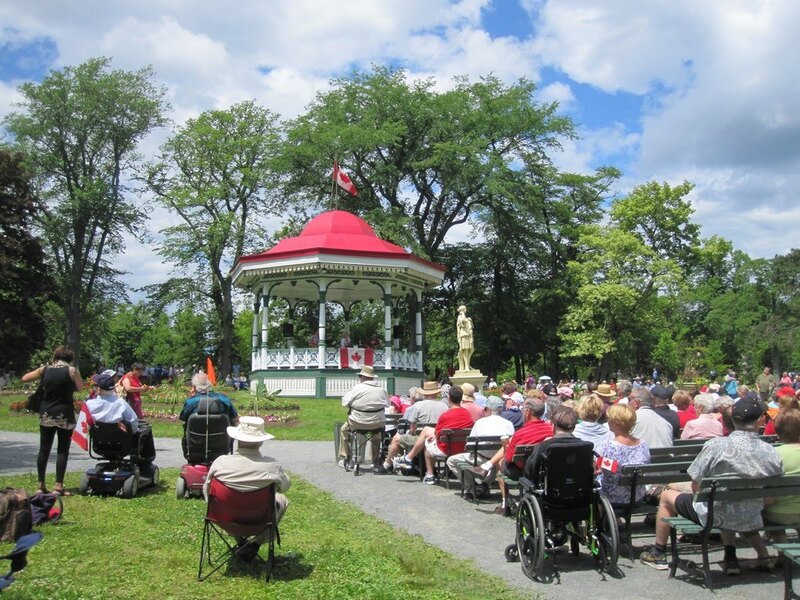 At 2:00 PM, the Public Gardens was hosting a free outdoor concert at the Band Stand. More importantly, they were also giving out free maple cookies. 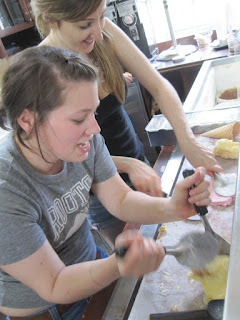 It was also getting hot by this point in the day, so I broke down and bought some excellent hand-paddled vanilla-peanut butter-fudge ice cream at the Sugah! ice cream shoppe in the Gardens. 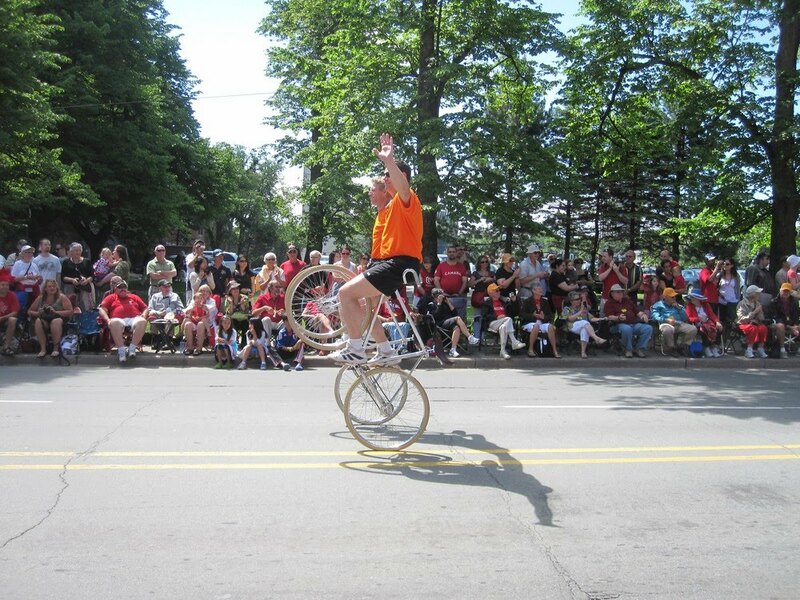 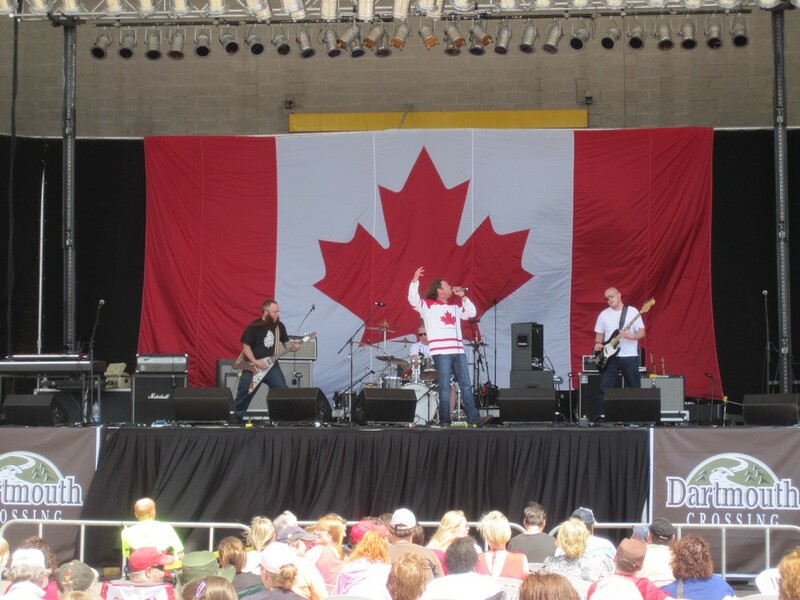 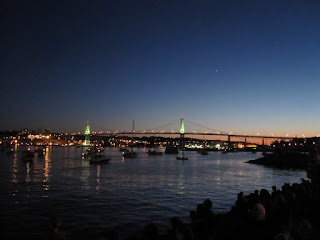 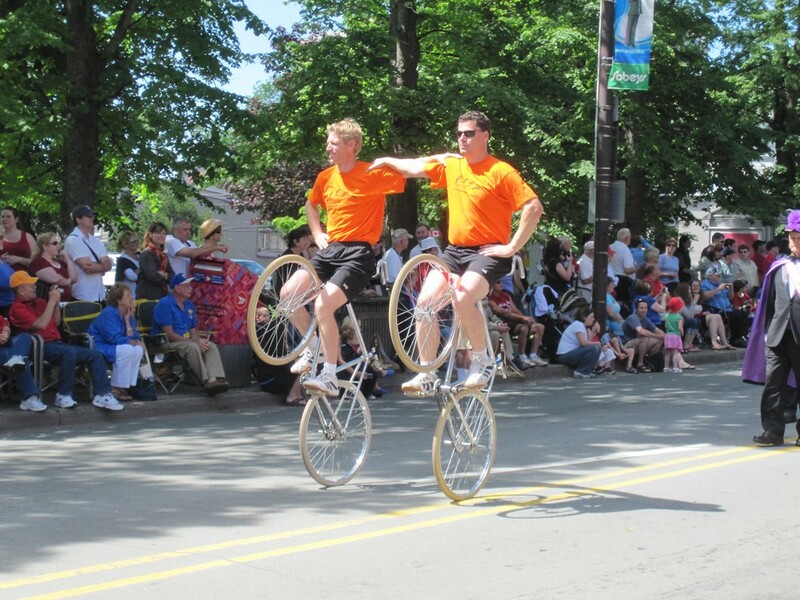 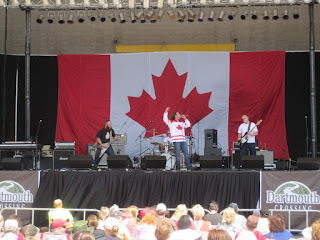 At 3:00 PM, I peddled my bicycle across the Angus L. Macdonald Bridge to Dartmouth for the Molson Canadian "Canada Rocks" free outdoor rock and roll concert, at Alderney Landing - along the waterfront of the north side of Halifax Harbour. 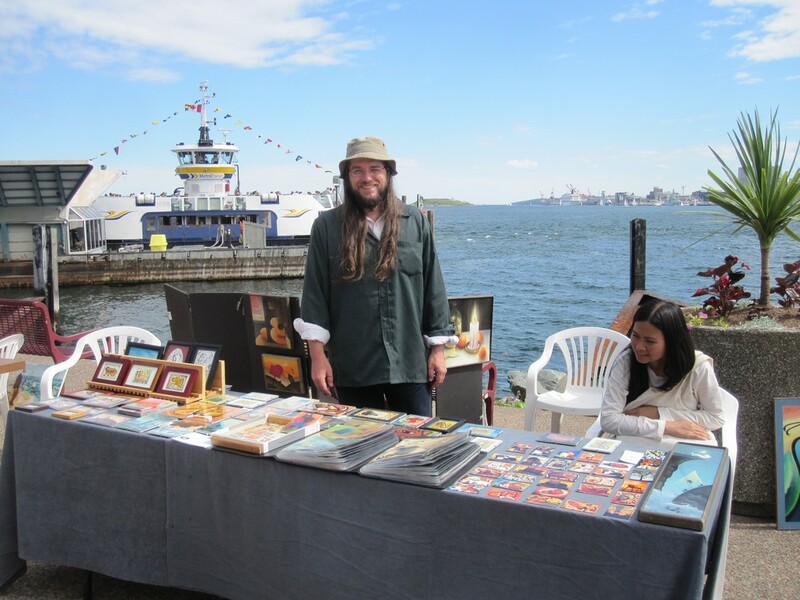 The concert was not the only thing going on at Alderney Landing; there was also a gathering of local artists on the waterfront. 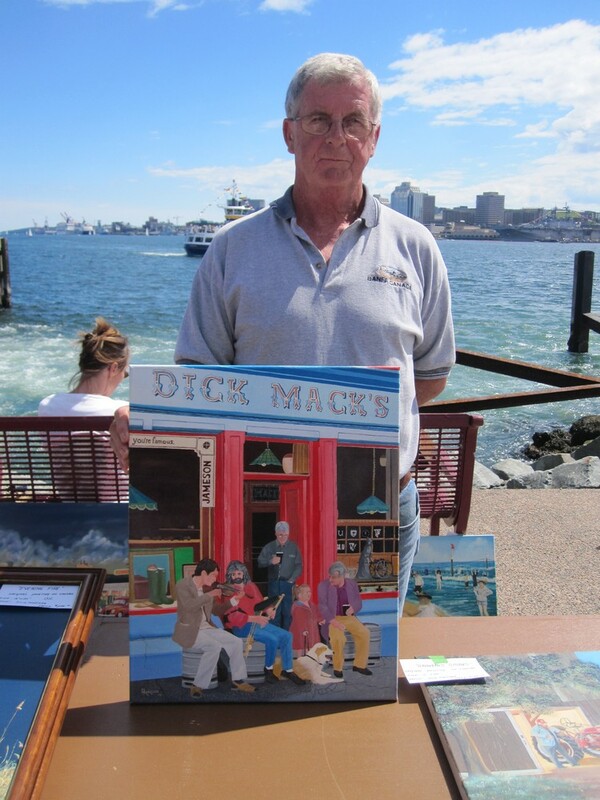 In the picture above, Dave King, owner of the Pugcasso website, poses in front of the Halifax Harbour with his prints and original paintings (mostly of dogs). 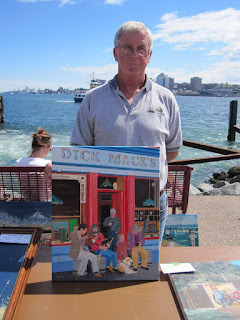 I decided to "support the arts" by buying a large magnet from him for $4. 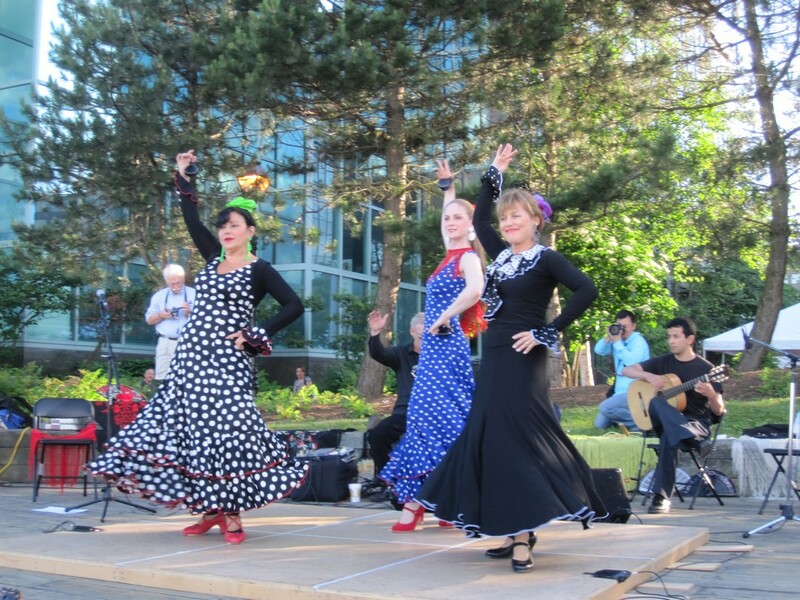 At 7:00 PM I cycled back across the bridge to the Sackville Landing on the Halifax side of the harbour to see Viva Flamenco perform a free hour long concert on the board walk. 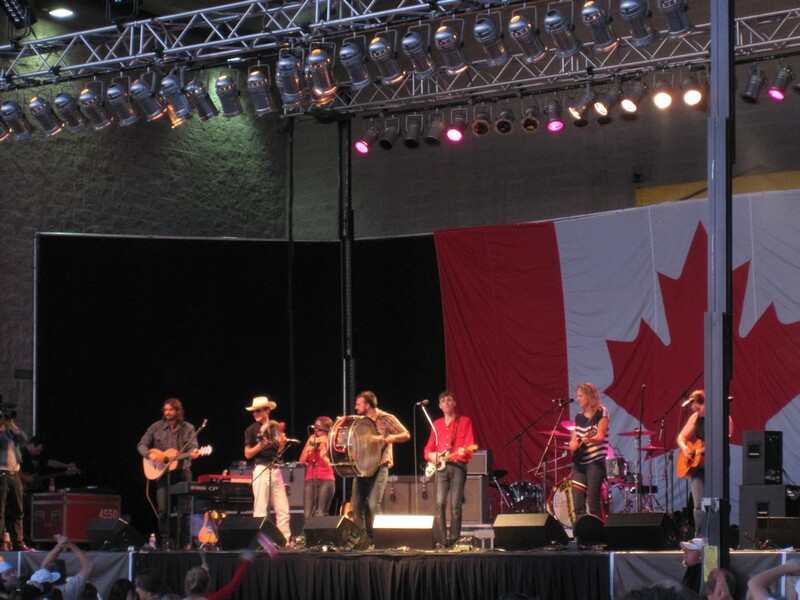 The concert also doubled as a fund-raiser for a maternal and child health care NGO providing much needed medical support in the worst damaged areas of Haiti. 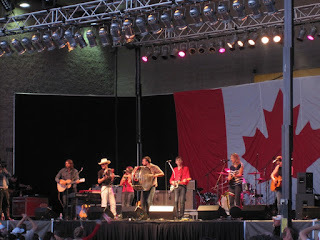 After the dancing, I hurried back to Dartmouth again to see more of the Canada Rocks concert. 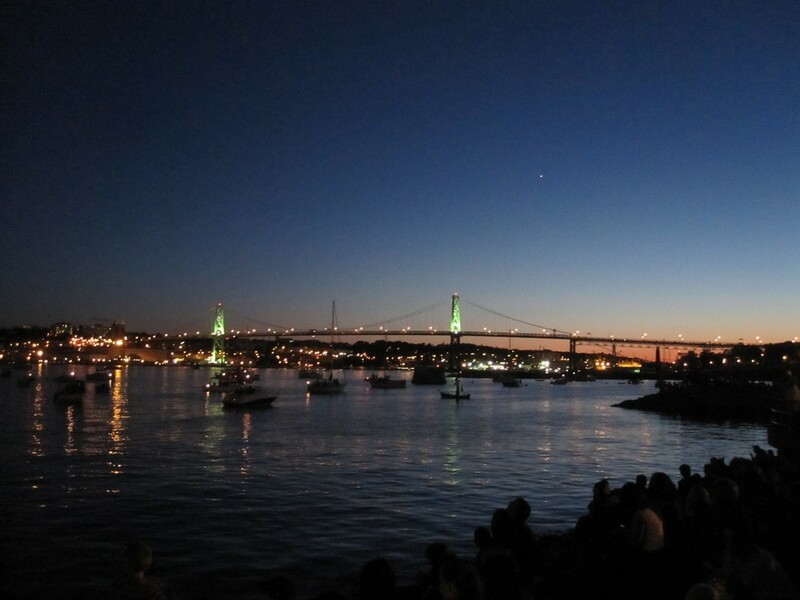 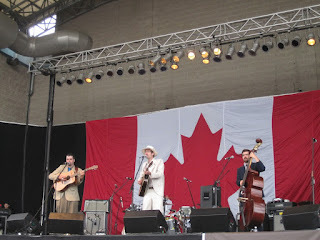 The Juno Award winning Halifax band, Joel Plaskett and The Emergencies, played a monster set from 8:00 PM until 10:00 PM, at which time everyone hustled over about 25 metres to the edge of the water to get a front row seat for the fire works display. The fireworks only lasted about ten minutes, and then it was back to the music as the rockin' went on until midnight. 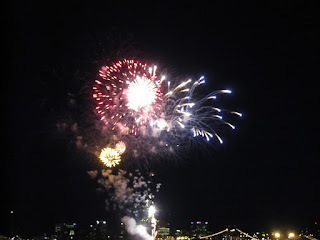 By this time though, I was exhausted, and I set out on the half-hour ride back across the bridge and uphill to my home. 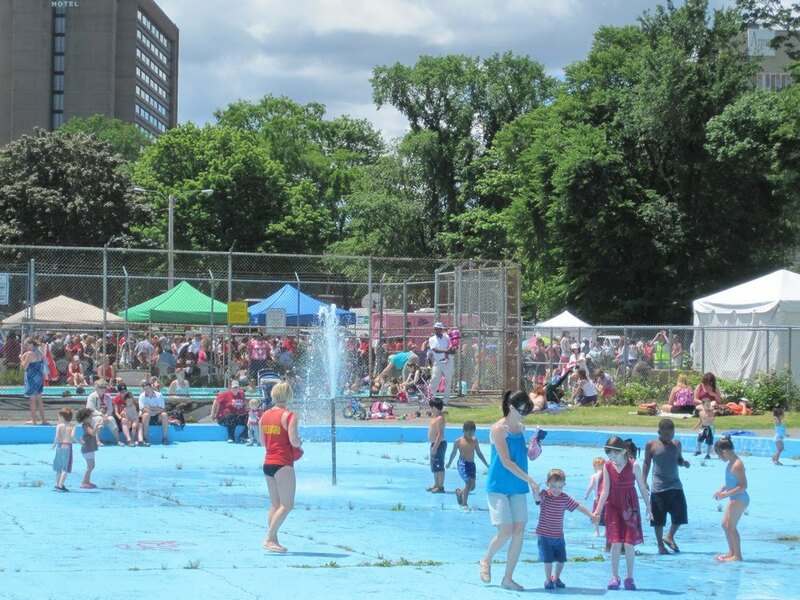 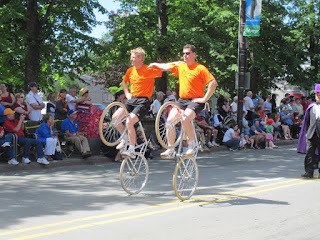 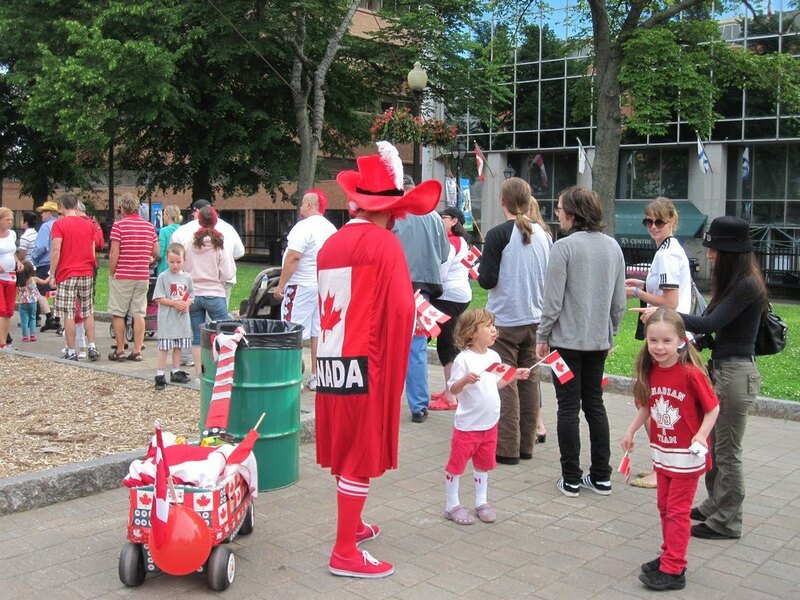 With the great weather, and excellent entertainment, Halifax was definitely the place to be to celebrate Canada Day this year.